An hour of lung-searing, snot blowing pain complete. Still another half-hour, plus five laps, to go. That voice in my head, which started as a gentle pleading, had now taken on an insistent, schoolmaster’s, tone. Stop being such a bloody fool. You’re serving no purpose here. Go home to your family. Hard to argue with that logic. I had already been lapped twice by the leading group and was marooned in windswept isolation. Cold. Humbled. Generally rather cheesed off. So I rolled up the finishing hill for a final time, climbed off, handed in my number and slipped quietly away before the race had drawn to its conclusion. 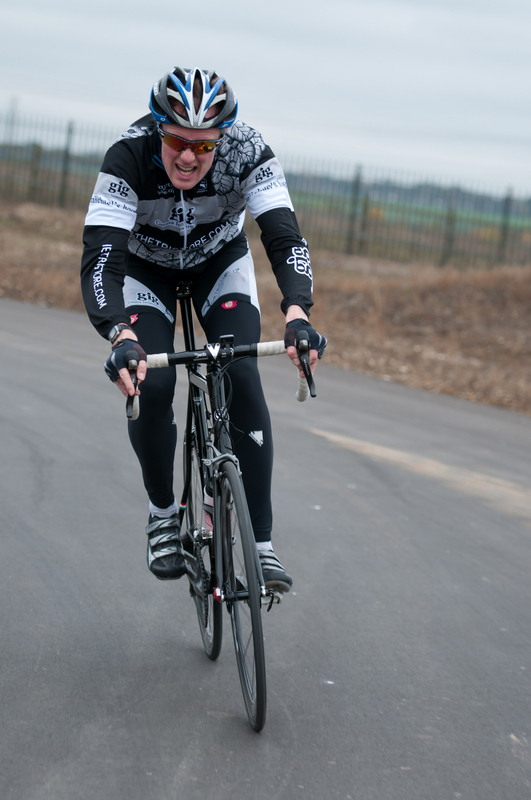 Just one of 17 non-finishers in this brutal examination of a man’s cycle racing credentials. You’ll already have guessed, dear reader, that I simply couldn’t let the bike racing itch go unscratched. Like an addict who knows in his heart that detox is really the only legitimate solution, I wanted just one more hit before I hung up my wheels on the 2011 season. Just one more. It’ll be fine. In fact in the pantheon of bright ideas it was right down there with Franklin’s decision to chart the last unknown swaths of the Northwest Passage. The only saving grace of the trip was the total media blackout I had imposed beforehand, which drastically reduced the feeling of failure afterwards. Nobody, other than the missus and lad, knew I was making the trip to Cyclopark, Kent’s brand new cycle sport/leisure facility, for the second round of the South East Road Racing League (SERRL) Winter Series. It was a top-secret mission, a deliberate reaction to the high profile approach I’d taken for the Omega Points Chaser, and one designed to keep any pressure to succeed at bay. No bad thing either – the first round of this series had attracted no fewer than 60 entrants and, crucially, it was open to both 3rd and 4th Cats, so I was exposing myself to the higher grade of rider for the first time outside of a handicap. 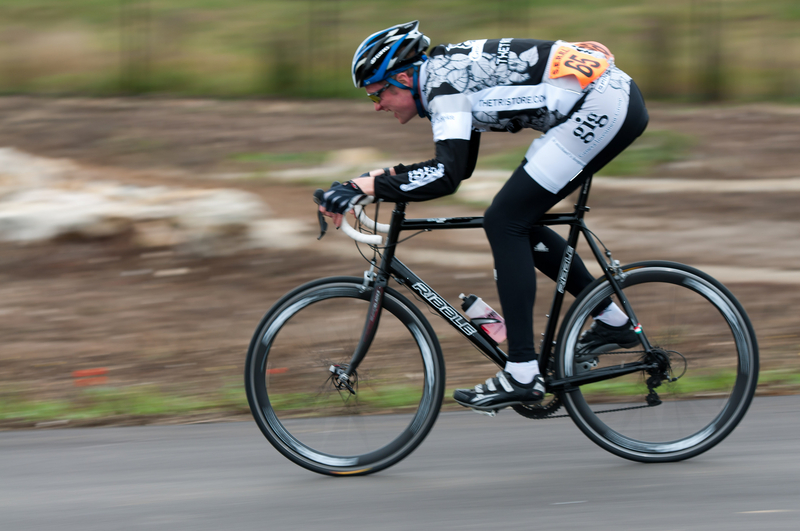 Cyclopark, which is near Gravesend, offers a whole host of two-wheeled pleasures, including road racing, BMX and off-road trails. It will be great when it’s finished; unfortunately that is still some time away. For now, it offers all the muddy, post-apocalyptic ambience of the alien planets they used to touch down on in Blake’s 7. While the facilities were ultra-spartan, SERRL’s organisation was anything but. It was my first experience of this league and I was impressed. All riders were issued with timing chips, which must have made sorting the results a heck of a lot easier than in the Surrey League. Plus there were two support motorbikes and even a motorbike-borne photographer, who caught the action shot you see to the left. They’d also sensibly employed a mobile coffee/cake vendor, who did a brisk business defrosting abandonees such as myself as well as various long-suffering partners and children dragged along to spectate. What of the race? Well, I knew it would not be my day before the thing even started, as I was almost dropped on the ‘installation lap’ conducted by both fields (the Elites, 1s and 2s were racing concurrently) behind the safety motorbikes. Once the flag dropped, the action started immediately as several riders went off the front as though their lives depended on it. The pace was bewilderingly quick and within a moment I was struggling at the back. It didn’t help that the Cyclopark course had just about the worst possible layout for me, all short straights, tight corners and sharp, punchy ramps. Nowhere, in other words, for me to build up the requisite head of steam to suit my chugging, ocean liner style. Memories of Hove Park came flooding back as I battled for a lap or so to stay in touch with what was left of the main bunch (the escapees were long gone, and indeed held on to the finish), a battle that proved as forlorn as those two miserable efforts in Brighton. It was just a case of one acceleration too many; my throat was raw, my nose was getting constantly blocked and my lungs seemed like they were full of liquid instead of air. I was so close to bailing right there, less than ten minutes into the race. And I wouldn’t have been the only one, since the crowd at the finish line very quickly swelled with riders who had cried enough. I was kept going by pride, plus a feeling that I might as well get some training miles in to justify the hour-plus car journey. I even managed to make up a place or two on the road and I knew there were still a few laggards behind me. But by the afore-mentioned hour mark, pride alone was not sufficient to quieten the voices of disapproval. A man has to know his limitations. And when his time will be better served elsewhere, like at home mixing the Christmas pudding. So, my season is over. There really is nowhere left to run. I guess I’ve learned quite a lot over these nine months and 17 races, some of which I’ll try to impart on this blog in a few days, in the hope that it might help other ‘newbies’ starting out next year. If I’ve been hard on myself in this blog it doesn’t mean I haven’t enjoyed my first season of racing – in fact more of the hyper-critical self-analysis is done purely for darkly comedic effect than many people realise. I’ve had a whale of a time, believe me. Sport-wise, it’s the best thing I’ve ever done. By a country mile. After taking a much-needed break from thinking constantly about bike racing I will get back into the swing of things in a few weeks. In fact I’m already eyeing up some potential openings in the Imperial Winter Series at Hillingdon which, mercifully, keeps the 4th Cats protected from the 3rd Cat bully-boys. Great stuff – the writing not the racing. At least you didn’t have to eat your own shoes. I got dropped in a crit this year when I took the step up from the Go-Race/4th cat to the E12/34 handicap race that was on the same schedule. The only saving grace was that a club mate – knocking on the door of 2nd cat no less – was dropped before me. It seems to be an occupational hazard for cyclists! Once again, your race commentary makes me smile in recollection of my own races when I asked myself those same questions.